Too often with a family room, we’re faced with boxy architecture and a room with very little character. It’s all about bringing personality and personal touches into an otherwise unassuming space. One of the big challenges with designing a family room is finding a happy medium between form and functionality—placing the primary focus on comfort while also keeping the overall design elevated so that it’s a space you’re proud to show off with the rest of the house. We enlisted our Celebrity designe duo Massucco Warner Miller to share some designer tips and tricks to help you achieve family room perfection at your home. You can learn more about Massucco Warner Miller’s design philosophy here and also work directly with them through Decorist. 1. Think functional and flexible. Given all that goes on in a family room—it is for the whole family after all—functionality and room flow are critical. When you set out to redesign or even do a light refresh, approach furniture selection and room layout with flexibility in mind. Consider side tables that are sturdy enough to serve as extra seats (ceramic or wood garden stools are good choices) and ottomans that can be pulled in on game night. If space is at a minimum, up the functionality of a bookshelf or étagère and use it as a drop spot for homework. When textbooks are tucked away, it looks like the perfectly appointed bookshelf it was meant to be. 2. Mix materials and textures. To create a rich, interesting layered look, don’t be afraid to combine and contrast materials—from rustic woods to metals to leather and rope. The Celebrity design team likes to mix materials from different seasons, like a lightweight summery fabric on a sofa in the same room with a rough-weave rattan or chunky wool knit that you might see on a pouf or accent pillow. It’s about putting fears and conventions aside and experimenting (wicker and marble, anyone?) until you find something that feels right and makes you happy. 3. Layer your area rugs. A super easy way to punch up both color and texture in a room is to layer an area and an accent rug. If you already own a large neutral carpet (such as a jute, sisal or flat wool), use that as your base and layer a new (slightly smaller) patterned rug over it. 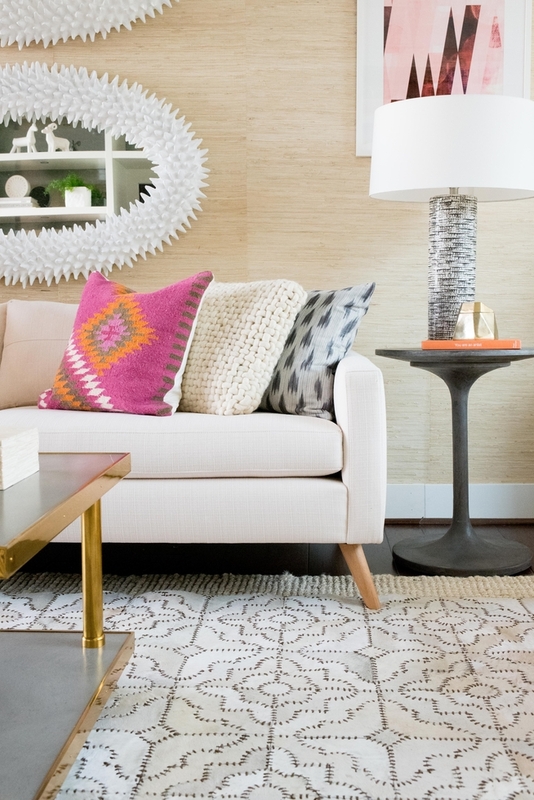 One-of-a-kind Moroccan rugs and colorful flatweave dhurries are always a safe and stylish bet. For proper sizing, the design team recommends using a base layer rug that is at least as wide or slightly wider than the width of your sofa and placing it so that it’s centered in the space. 4. Use the art you love. When it comes to art, make it a true expression of what you like. Don’t be afraid to buy what you love regardless of whether you think it’s going to work in the space. Often it’s the pieces that aren’t a conventional “fit” that make the greatest design statements (including framed kids artwork, which looks great hung gallery-style alongside purchased pieces). And, if it doesn’t work in the space intended, you love it so much, you’ll find a home for it elsewhere. Another trick to refreshing your art is to swap in new frames to lighten the look. Switch out black for white, gold or a light natural to lighten up your overall look. 5. Add warmth with the right wallpaper. A guaranteed way to elevate a space is to hang textured or patterned wallpaper. Grasscloth is a Massucco Warner Miller favorite and an instant way to add depth and warmth to a room. Traditional moldings and trim aren’t necessary to make a neutral grasscloth work—it can be cut cleanly at openings where there is no casing and still look very polished and pulled together. The designers do recommend hiring a pro to hang grasscloth as it’s one of the trickier textiles to work with and line up. 6. Use symmetry to streamline. Using symmetry and balance can evoke a sense of formality and elegance. With the many functions of a family room fighting for the same space, this balance can invite a sense of calm in a sea of activity. In a stroke of brilliance, the designers used symmetry in more than horizontal, left-to-right orientation. They also used vertical symmetry to create a balanced sophistication. The decorative mirrors stacked above the sofa an unexpected visual treat. Have fun with surprise moments of symmetry and find a balance that feels right to you. 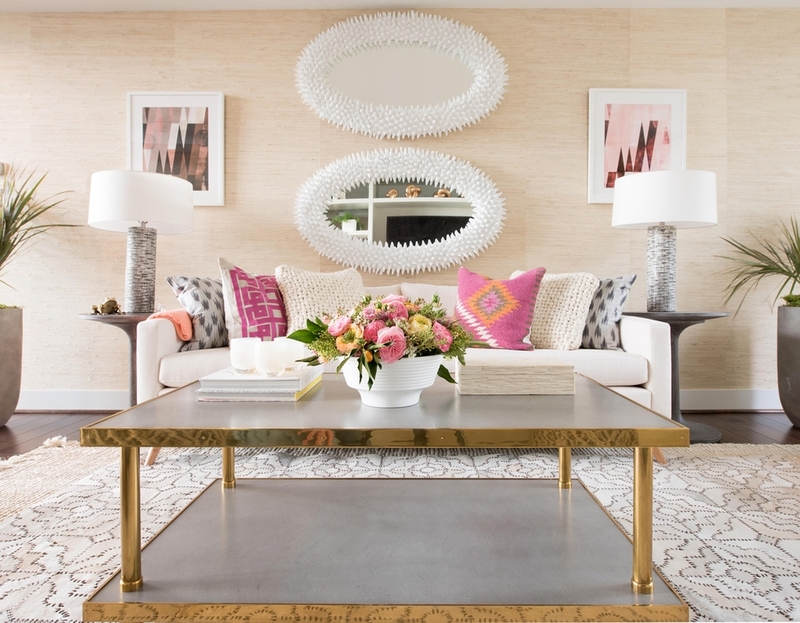 Work with a Celebrity designer to transform any room in your home—all for one low flat fee!